New Winemaker at La Crema After fifteen years as head winemaker for La Crema, Elizabeth Grant- Douglas has stepped down and Craig McAllister has become the new head winemaker. McAllister first joined La Crema as the harvest enologist in 2007, and has been a steward of La Crema’s Monterey and Sonoma Coast programs as associate winemaker. 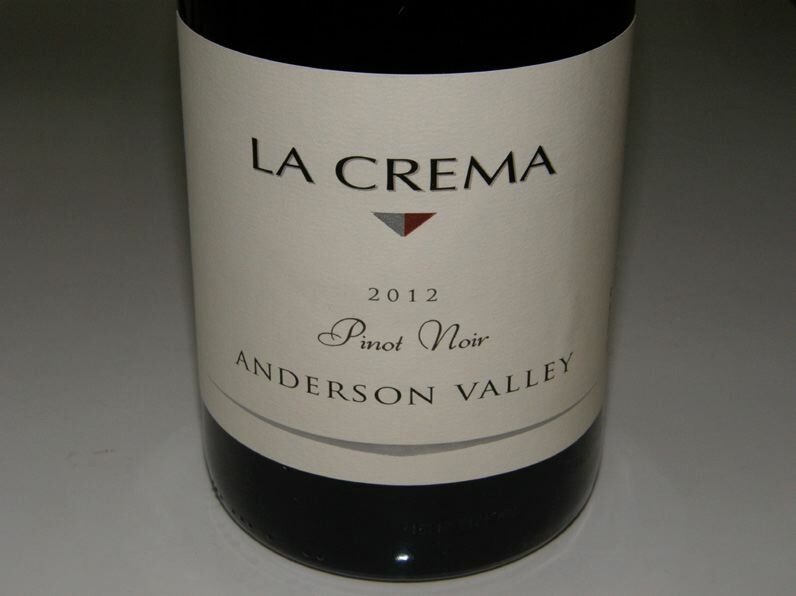 Elizabeth, who has been the head winemaker at La Crema for fifteen years, remains the winemaker for Maggy Hawk Pinot Noir from the Anderson Valley. Elizabeth leaves a legacy of a label that offers the consumer a variety of high quality wines at an affordable prices produced in largeenough quantities that make them widely obtainable in retail wine markets. La Crema is one of California’s iconic labels, first founded in 1979 as a family owned and operated winery focused exclusively on cool climate coastal appellations. The label is known for its appellation wines, but plans to expand into some single vineyard offerings. The name, La Crema Viñera, means “Best of the Vine.” The website is www.LaCrema.com. Farmhouse Inn in Russian River Valley Icons of Russian River Valley Packages Locals and visitors are invited to experience Russian River Valley’s premier Pinot Noir producers along with a weekend in wine country. Partnering with the Farmhouse Inn are winemakers from Williams Selyem, Kistler, Kosta Browne, Merry Edwards and Littorai. Each winery will host a dinner on a Friday night where they will share some of their favorite vintages from their cellars. Each winery’s wines are paired with Executive Chef Steve Litke’s Michelin menu. Saturday afternoon the dinner attendees will head out to the wineries for a special experience. Reservations for the weekends and room specials are at www.farmhouseinn.com. Petaluma Gap Soon be a recognized AVA An article appeared recently in the San Francisco Chronicle, “Windswept Petaluma Gap’s growers reach for wine imprimatur” (December 31, 2016). 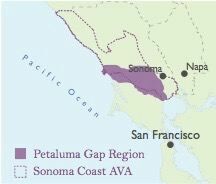 The Petaluma Gap region is currently part of the vast Sonoma Coast AVA, but is soon to become California’s newest AVA. A public comment period ended December 27, 2016, with no opposition. The Petaluma Gap AVA would extend from the coast at the northern tip of Tomales Bay to Sonoma Mountain and would be the seventeenth sub-AVA within Sonoma County and the only California AVA defined by its wind patterns. The Petaluma Gap is an opening in the coastal mountains and the Petaluma area is defined as a “wind gap,” with winds entering the region from the Pacific Ocean and traveling eastward, a rarity for California. The region has long been known for producing exceptional Pinot Noir grapes, but the grapes were go unrecognized by inclusion in Sonoma Coast bottlings. The challenge for the new AVA is that Sonoma Coast is an established and prestigious AVA title conferred on some of California’s most outstanding Pinot Noir bottlings. Soon the consumer must be sophisticated enough to recognize the Petaluma Gap designation as the equal of the Sonoma Coast designation. The Sonoma Coast AVA is undergoing further division with petitions in the works for Freestone-Occidental, West Sonoma Coast and Sebastopol AVAs. Fort Ross-Seaview AVA has already been approved. Read the full article at http://www.sfchronicle.com/wine/article/Windswept-Petaluma-Gap-sgrowers- reach-for-wine-10828639.php. Historic Vineyard Society (HVS) This organization is an attempt to preserve old historic vineyards that are 50 years or older in California. Many of the vineyards are much older than that, even dating to the 1880s. The oldest continuously producing Pinot Noir vineyard in California is at Hanzell Vineyards (dating to 1953). For information, to register a vineyard or make a donation, visit www.historicvineyardsociety.org. Does Organic Wine Taste Better? An article was recently published in the Journal of Wine Economics, titled, “Does Organic Wine Taste Better? An Analysis of Experts’ Ratings.” Data from three leading wine-rating publications (The Wine Advocate, Wine Enthusiast and Wine Spectator) were used to assess quality of 74,148 wines produced in California between 1998 and 2009. The results indicated that ecocertification was associated with a statistically significant increase in wine quality rating. Being ecocertified increases the scaled score of the wine by 4.1 points on average. It is important to point out, as do the authors of this study, that wine operations might use similar practices as ecocertified operations (and many do), but choose not to obtain ecocertification. If so, the estimates would understate the impact of such practices. Tasting, Spitting and Alcohol Absorption I have written about this topic and questioned the danger to wine critics who repeatedly taste a large number of wines at one sitting. In 2012, an article appeared in the journal Wine Studies (an Open Access, peer-reviewed scientific journal) that addressed the absorption of alcohol while spitting: “The Bac(chus) experiment: blood alcohol concentrations after wine tasting.” Blood alcohol concentrations (BACs) were measured in ten volunteers after a wine tasting event with and without the swallowing of 15 ml (about a half ounce) of each wine ( a total of about 5 ounces or 1 glass of wine). When ten wines were tasted within one hour without swallowing, buccal mucosa absorption was low, with BAC’s averaging 0.0026 percent, far below the legal driving limit. However, when 15 ml of each was was swallowed, the BAC’s, half of the ten test subjects measured a BAC of 0.05 percent, above the legal driving limit in some countries. It would be of interest to redo such an experiment with tasters sampling many more wines at one sitting. Aging Leads to Fading of Smell More than Taste An article in Decanter China by Elin McCoy looked at the science behind changes in smell and taste with aging. Research has found that the ability to smell fades much more than the ability to taste as we age. The degree of decline in the sense of smell varies widely and the loss of specific aroma sensitivities also is fickle. Wine critics may compensate for a decreased ability to smell nuances with taste memories and experience, and some wine professionals retain their smell and taste faculties well into a late age. New Willamette Valley sub-AVA Proposed Ernie Pink, proprietor and winemaker of Amalie Robert Estate, along with his neighbors, is submitting a petition to establish a new sub-AVA in the Willamette Valley. The area is located in the mid-point of the Willamette Valley, longitudinally speaking, about 60 miles south of Portland, 15 miles west of Salem and nestled into the foothills on the western side of the Willamette Valley. The area surrounds the 835 foot summit of Mt. Pisgah in Polk County, near Dallas, Oregon. The proposed AVA would be the southernmost AVA located with the Willamette Valley AVA and does not affect the recent expansion of the Willamette Valley AVA. The tiny sub-AVA consists of about 4,100 acres comprised of the following producing vineyards and wineries: Amalie Robert Estate, Freedom Hill Vineyard, Croft Vineyards, Erratic Oaks Vineyard, Illahe Vineyards & Winery, Open Claim Vineyards, and Mistletoe Vineyard. The proposed name of the sub-AVA is Mt. 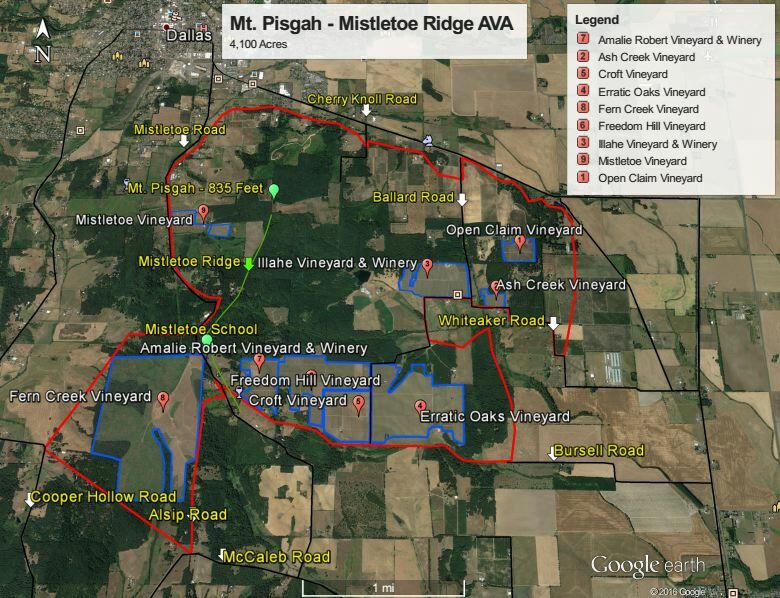 Pisgah-Mistletoe Ridge. Approval of new AVAs typical takes four years. The idea of another nearby sub-AVA in the Monmouth, Oregon, area, “Monmouth Independence,” has been bantered about and is early in the process. This AVA would include the Maple Grove Vineyard owned by Jackson Family Wines and Domaine Loubejac under the Northwest Wine Company ownership.